Last week, we posted a link to a transcript of David Einhorn’s testimony before the Financial Crisis Inquiry Commission provided by Santangel’s Review. The FCIC released audio recordings of many of the interviews conducted by commission staff but in most cases written transcripts were not provided. The lack of a written record resulted in most of the interviews escaping much notice in the media. 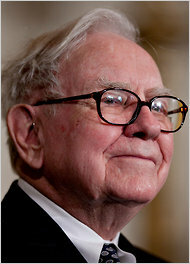 Santangel’s Review recently published a 23 page transcript of Warren Buffett’s FCIC testimony recorded on May 26, 2010. Mr. Buffett played a central role during the darkest days of the financial crisis when Berkshire’s investments in Goldman Sachs and General Electric served to instill confidence in the financial system. In the interview, Mr. Buffett shares his thoughts on his investment approach during the crisis along with many other interesting topics. Andrew Ross Sorkin wrote an article in The New York Times yesterday based on the interview transcript. The interview appears embedded below in the Scribd format and a link is provided for those who are reading this through an RSS feed. As an aside, we encourage readers to sign up for the Santangel’s Review mailing list and sample issue which contains a detailed review of the track record and investment approach of one “undiscovered” hedge fund manager.